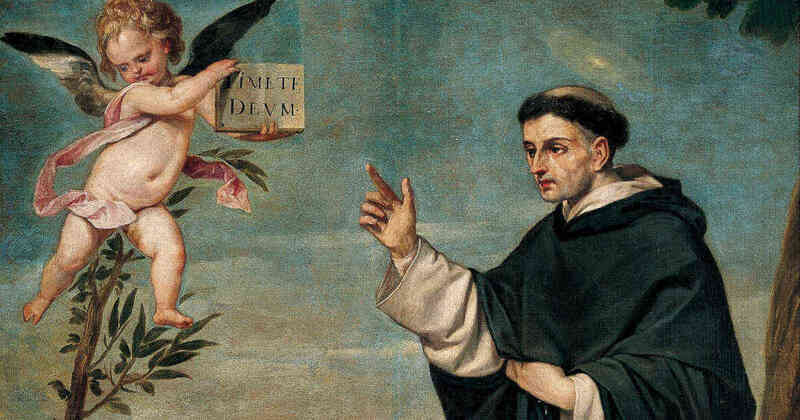 Saint Vincent Ferrer, Priest - My Catholic Life! Saint Dominic de Guzman, a Spanish priest, founded the Order of Preachers in the early thirteenth century. He wanted to establish an Order of priests who were well educated in theology, adept at preaching the truths they lived, and who had more flexibility than a monastery-bound priest to travel and evangelize. Over a century later, today’s saint was born in Saint Dominic’s own country, joined the Dominican Order, and carried out in the most dynamic and complete way the essential vision of Saint Dominic. Saint Vincent Ferrer was well educated and a powerfully effective preacher. He travelled almost without cease throughout Western Europe, impacting the lives of untold thousands of people through his example of holiness, his supernatural gifts, and his preaching. Saint Vincent was the ideal Dominican. Vincent was born in Valencia, on the southern coast of Spain, to an English father and a Spanish mother. He was named in honor of Saint Vincent Martyr, who met his death in the same city in the fourth century. Vincent received an excellent education and earned a doctorate in theology at a young age. It was said that he read exclusively Scripture for three full years and had committed much of it to memory. He taught philosophy and then took up advanced studies, in Barcelona, of Islam and Judaism. Spain had a sizeable minority of Jews, and Muslims still controlled large portions of Southern Spain in Saint Vincent’s day. So these studies were not merely theoretical. Saint Vincent converted a large number of Spanish Jews and interacted with Spanish Muslims on a regular basis. The ecclesial event which most marked our saint’s life was the Western Schism of 1378–1418. This painful episode saw two, and eventually three, cardinals claim to be the validly elected pope. This open wound pained the Church for two generations. Some Europeans lived their whole lives knowing only a bitterly divided papacy. The Western Schism proved so intractable a problem, and caused such scandal, that it can be argued that it was the remote spark of the Reformation which caught fire through Northern Europe about one hundred years later. Such were the complexities of the Schism that Saint Vincent found himself on opposite sides of the issue from Saint Catherine of Siena and various other deeply committed and holy Catholics. Our saint spent most of his life as an itinerant preacher on the highways and byways of Spain, France, and Italy, drawing enormous crowds and inspiring them to a deeper life in Christ. Near the end of his life, Vincent’s effective preaching played a decisive role at the Council of Constance in 1414. He convinced the Spanish King to cease supporting the very pope who Vincent had previously backed in the Schism. Vincent was man enough to see that his candidate had become an obstacle to Church unity. Vincent thus lived a hard lesson in humility when his man was abandoned, excommunicated, and judged by history to have been an antipope. Saint Vincent fittingly died on one of his incessant missionary journeys, far from home in Northern France, at the age of sixty-nine. His reputation for holiness was such that he was canonized a saint in 1455, within the lifetime of many who had heard him preach. 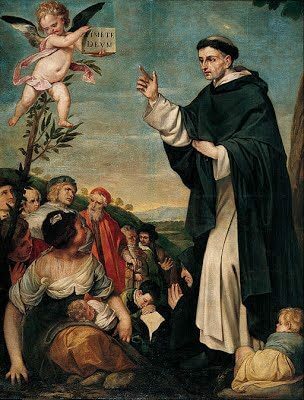 Saint Vincent Ferrer, you lived a life of fervor and dedication to the truths of the Catholic faith, imparting the education you received to others through your witness and preaching. Come to the aid of all teachers and preachers to emulate your virtues with your same zeal for the house of the Lord.